Our interactive Google Map identifies the locations of many of the places to visit. The place name link to the locations own web site, where available. If we have more photos of the area described, you can follow the link to view them on our Flickr website. The distance and travel times quoted are from La Ville au Tady. 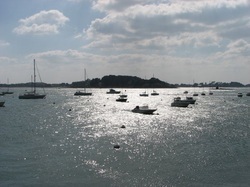 There are some great views out into the Islands of the Gulf of Morbihan, the photo here shows the Ile d'Arz. 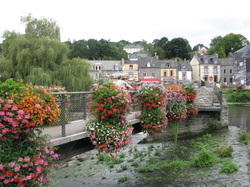 Auray is built on the steep-sided estuary of the Loch, which at this point is called the River Auray. 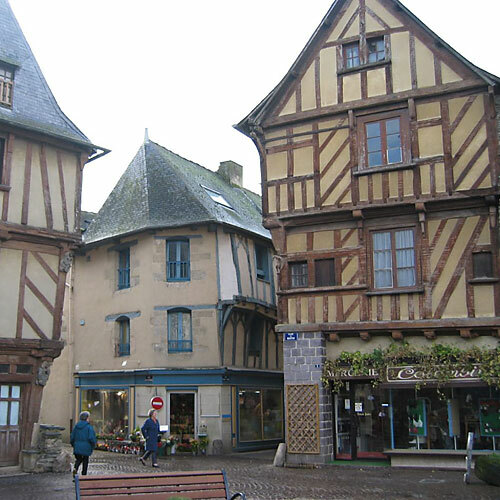 One of the roads linking Auray with the port houses a collection of interesting artist's shops. If you have a sweet tooth, don’t miss the Biscuitier Chocolatier just before the bridge, who make a wonderful selection of chocolate and mini Kouign Amann (a rich buttery cake) in an amazing number of varieties. Saint-Goustan is reached by crossing the old stone 17thC bridge. The character of the old port is remarkably well preserved, and the narrow cobbled streets give the feel of an old smugglers haunt. We had a lovely couple of hours exploring the narrow lanes and just sitting and watching the world go by. We visited in April and it was quiet, but I understand it can get very busy in August. 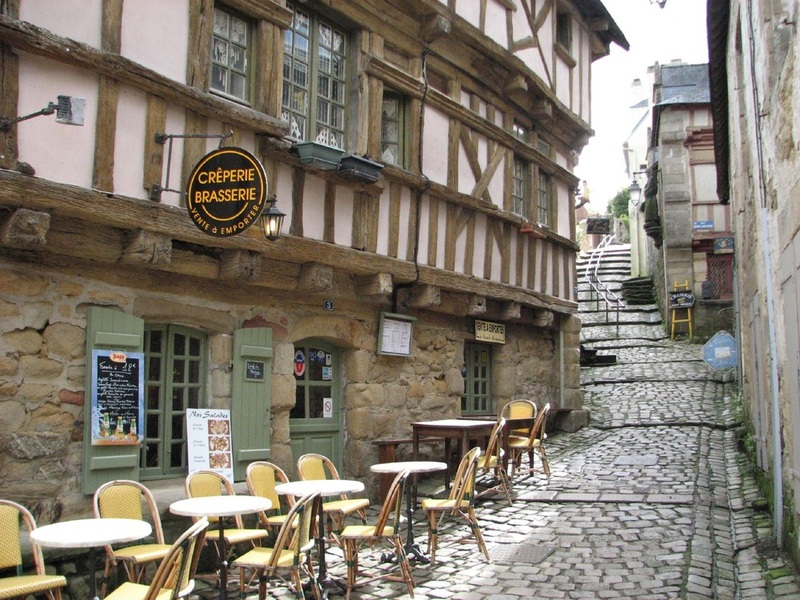 We ate lunch at the Saint-Sauveur crêperie, tucked away off a steep cobbled lane, a small but cosy restaurant which seemed to be favoured by the locals as well as the tourists. Tastefully and thoughtfully decorated, it was the authentic French crêperie experience. Population 12,200. Auray & Saint Goustan photo album. 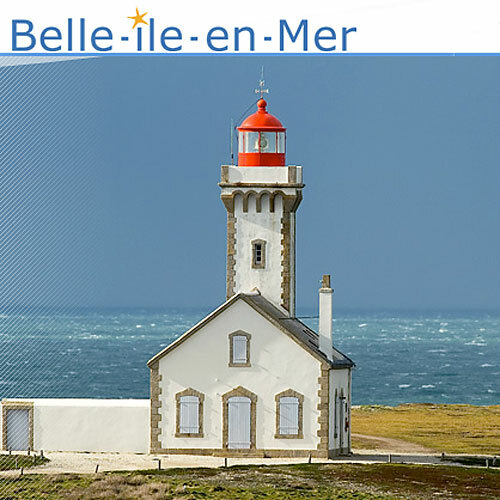 Belle-Ile means the Beautiful Island (10 miles long and up to 6 miles wide). 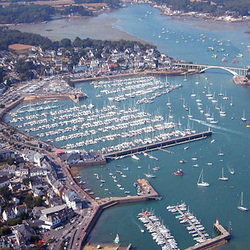 The largest of the Breton islands, it was a favourite haunt for Saxon pirates and Norman invaders until given to the abbey of Redon in 1006. Even the shutters on the houses, which under local bye-laws have to be painted in pastel colours, add to the picturesque effect. 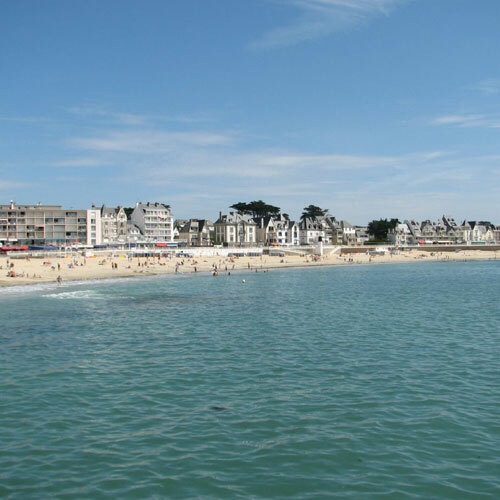 The green, undulating countryside and vast beaches make it an ideal day trip from Quiberon. In summer the population can swell from 5,000 to over 35,000, but rarely feels crowded. 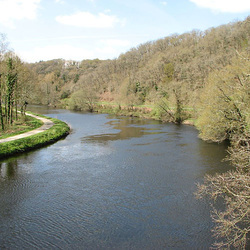 The scenic winding valley of the Blavet extends from Lac de Guerledan, 17km north of Pontivy, to meet the sea at Lorient. You can follow its route by bicycle, canoe or on foot. The little riverside hamlet of St Nicolas-des-Eaux has all the things you could want for a relaxing afternoon. A collection of shops, restaurants and bars, with plenty of picnic tables beside the river Blavet where you can spend many an hour watching the boats go through the locks. Discover the picturesque Blavet Valley by boat. Starting from St Nicholas des Eaux there are 4 boats which will take you down the Blavet on a cruise lasting 1h30 with full commentary. A buffet is available on board the boats. You can undertake a circular walk using the main road bridge at one end and an old railway bridge at the other (allow about an hour). You can combine a visit to the Blavet Valley with Poul Fetan for a day out. Discover some 1,000 animals, originating from all five continents and roaming freely: giraffes, zebras, oryx, hippopotamus, otters, lemurs, wolves, red pandas, primates and many more, in an outstanding landscaped setting. Branféré is a thousand miles from the traditional idea of a zoo; it is an extraordinary place which has earned a Travellers Choice Award from TripAdvisor. 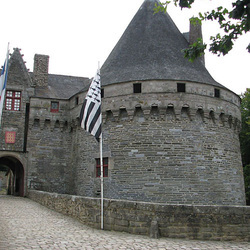 Although we have not been ourselves, those who have been describe it as a "brilliant day out" and a "must see" if staying in Brittany, so it is highly recommended. The park is open daily except in winter, and an admission fee is charged. 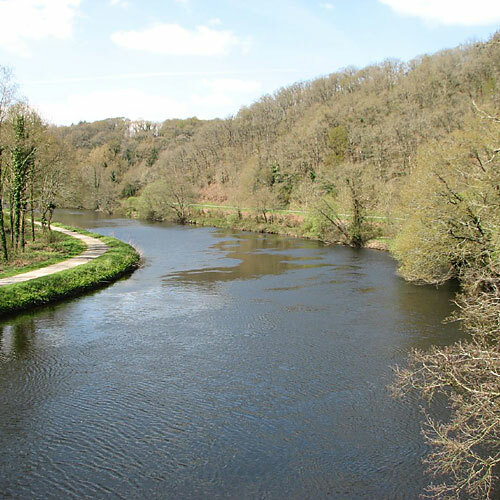 Also known as the Forêt de Paimpont, this area is traditionally linked with King Arthur and the sword of Excalibur. Those that come in search of sights of Arthurian legend are likely to be disappointed! But the area does have a certain mysterious quality, so all that its required is to add imagination. 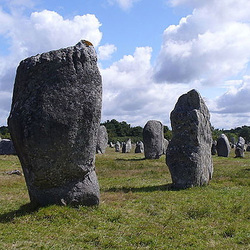 Carnac Standing Stones photo album. 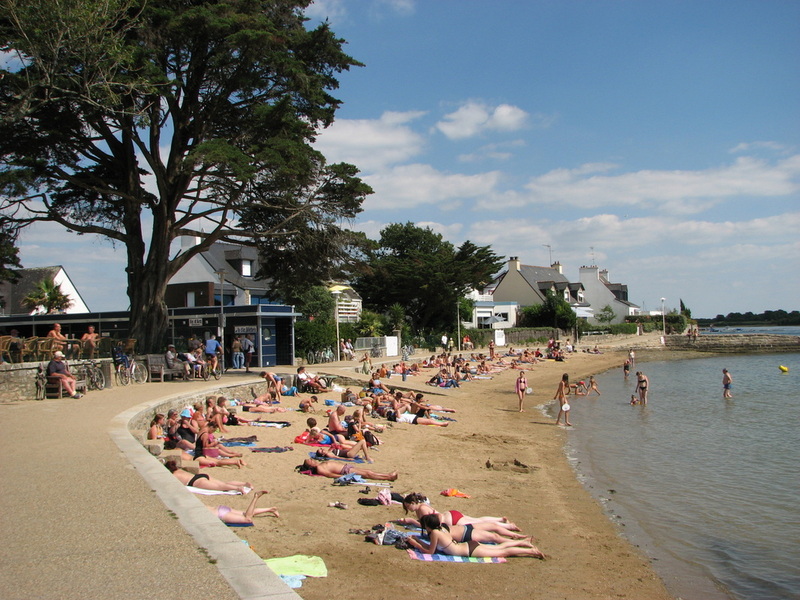 The five Carnac beaches stretch over 3 to 4 km (2.5 miles). Golden sands and plenty of space, even when it gets busy in late afternoon. Lovely lively café area and shops. Small amusement area and shows for children. Beach club in season. There is a coastal path and the coastline alternates between capes and sandy coves, much favoured by family holidaymakers. Surfboarding is an all-season sport here. 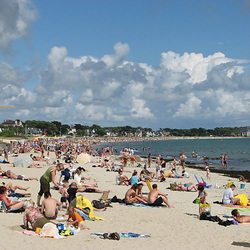 Carnac can get very busy during the peak holiday months of July and August. 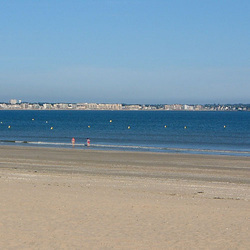 Recommended by France magazine as one of the 20 best beaches in France. Population 4,400. Carnac Beach photo album. The current castle was built in 1710. In 1872 the park of 175 hectares was developed. The arboretum contains rare and exotic trees from the Americas, Asia, North Africa and Europe. 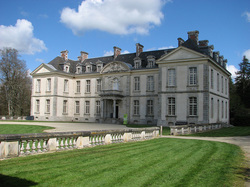 The General Council of Morbihan bought the estate from the Countess d'Humières, and have installed a contemporary sculpture park. The Chateau is open to the public in summer, with the ground floor and kitchens displayed as they would have looked when the castle was lived in. The first floor of the castle houses a modern art exhibition. The old outbuildings contain a café which provides snacks and light lunches, and further art exhibitions. In good weather you can take a picnic and enjoy it beside the lake, where you might see herons, grebe, spoonbills, egrets, hobby, buzzards, kingfishers and if you are lucky, otters in the little river beside the lake. Opening dates: April to June Fridays, Saturdays and Sundays, 1400-1800; July & August: daily, 1100-1900; September to October: Fridays, Saturdays and Sundays, 1400-1800. Guided tours in July & August. 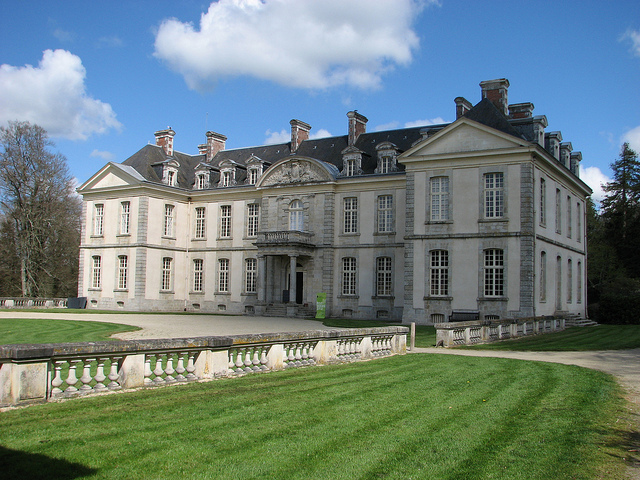 Access to the grounds and ground floor of the château is free, charge for tours. Chateau de Kerguehennec photo album. 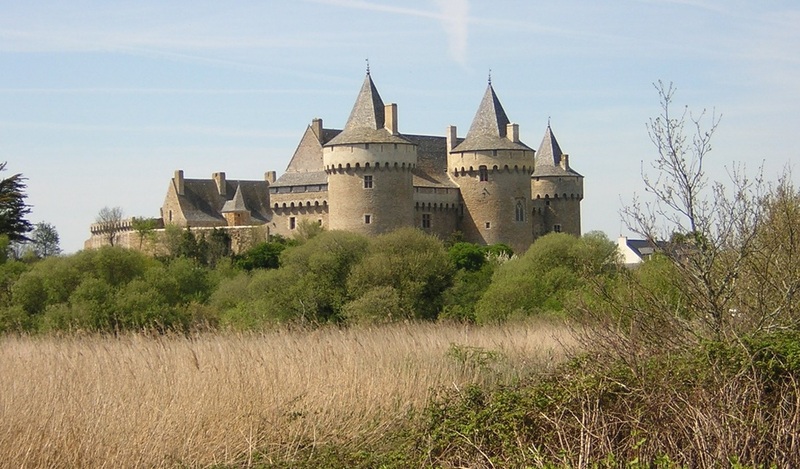 The Château de Suscinio or de Susinio is a French castle, built in the late Middle Ages, to be the residence of the Dukes of Brittany. 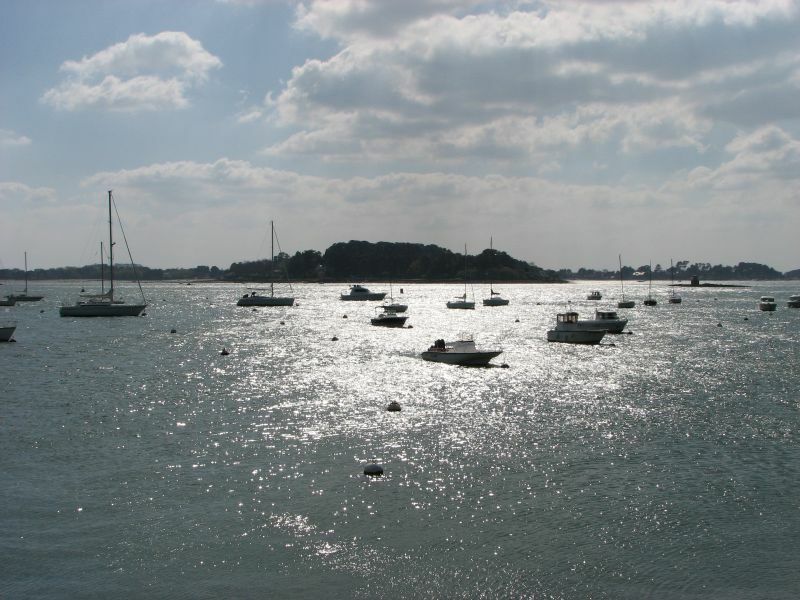 It is located in the commune of Sarzeau in the département of Morbihan, near the coast of the Atlantic ocean. The spectacular site comprises the moated castle, a ruined chapel, a dovecote, and a few ruined outbuildings. Can be combined with a visit to Arzon peninsular, which has some lovely beaches. 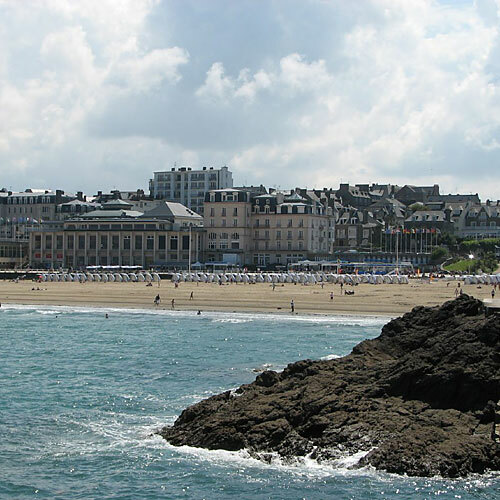 Situated right on the coast opposite St Malo, sitting atop a rocky headland above the Rance, Dinard was a popular spot with the British in Edwardian times; they still visit today for the bracing sea air and a stroll along the promenade. The seafront is lined with Victorian Villas, many of which are listed buildings, which ensure the town still retains its elegant and sedate old world character.The main beach is La Grande Plage. a strip of sand between the two peninsulas that define the edges of the old town. It is popular with families and is crowded on hot days. Smaller and more isolated is Plage de St-Enogat, a 20-minute walk east through the village of St-Enogat, or Plage du Prieuré, just a 10-minute walk from town. 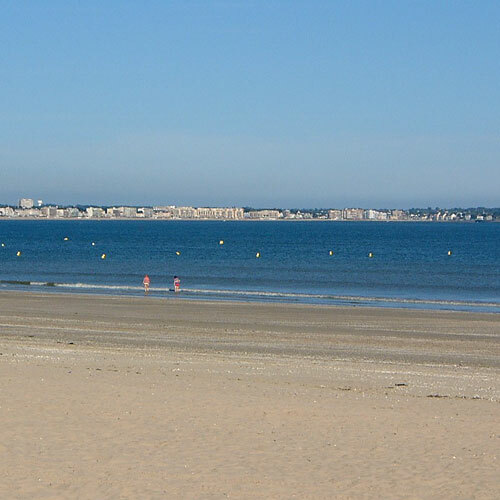 There is a great difference between high and low tides, and swimming pools along the Grand Plage and the Plage du Prieuré beaches catch seawater during high tides for those who opt not to make the trek along the salt flats during low tides to bathe in the sea. 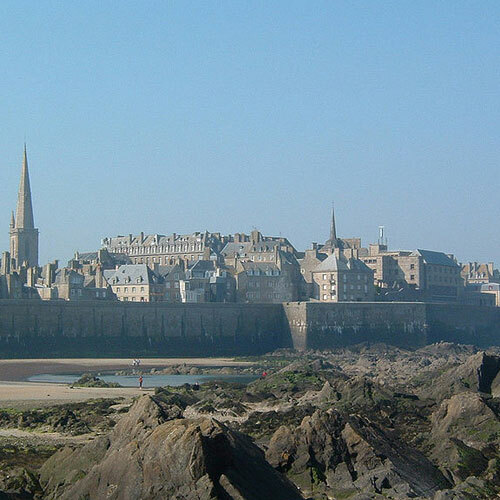 A footpath cut into the base of the cliff rocks provides a scenic route that links the different beaches, and from here you get the best view of the walled city of St Malo across the bay. We had a nice lunch at the ancient Old Auberge opposite the church in the centre of town. Market day is Thursday and many shops are closed on Mondays. The nearest town to the cottage. The most striking feature of this charming medieval town is its mighty three towered chateau that dominates and reflects in the banks of the Oust. Within the Castle stables is housed the Musee des Poupees (famous doll museum) containing 600 dolls within a collection started in 1880 by the Rohan family. There are several streets lined with 16th and 17th century housing, and one of the best preserved houses the excellent Tourist Information Office. There is a good selection of restaurants and pavement cafes where you can relax around the square and watch the world go by. Alternatively, if you fancy a little more action, you can hire bikes and explore the good quality canal paths, or hire a boat. Key dates are, Medieval Festival on Bastille Day on July the 14th, and Pardon on the 8th of September. In summer you can climb the church tower for stunning views of the Chateau, town and wider countryside. Free open air music concerts each Wednesday evening during the summer months. There is a lively Saturday Market. For more information see our Josselin page. Population 2,600. Josselin photo album. La Baule's marina and former fishing harbour, Le Pouliguen, is still a busy port and retains its original narrow winding streets. The resort is famous for its shady 15 acre park the Bois d'Amour (the wood of love), a favourite for walking and playing games such as boules. A pretty village located on the banks of the River Aff between Vannes and Rennes. La Gacilly is synonymous with the late Yves Rocher who created and ran his cosmetics empire in this charming Morbihan village; it’s also renowned for its arts and crafts and superb summer flower displays. From June to September La Gacilly hosts the largest outdoor photographic festival in France. The aim of the festival is to make the public think about the future of the planet. Many of the open air galleries are within the grounds of the Yves Rocher site, which include a quality restaurant, shop and treatment rooms. The company was founded in La Gacilly in 1959 and now operates in 88 countries with a turnover of 2 billion euros. 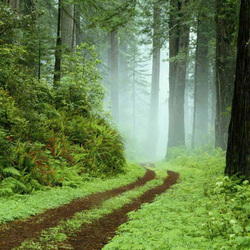 Their products are based on using natural plants and their botanical garden contains 1100 species of plants. May of the fields surrounding the village are used to grow the plants used to manufacture the cosmetics. There is a good selection of cafes and restaurants to eat and the old granite cobbled pedestrianised streets allow you to explore a wide range of craft shops from puppet makers to jewellery designers and from potters to glass blowers. We had some good galettes at the Creperie La Mauvaise Graine in the centre of old La Gacilly. The Day Boats base is found on the river bank where you can hire electric powered boats from Mike and Lynn seating up to 6 persons by the hour, half-day or day. Parking can get difficult during the peak summer months, the free parking at Yves Rocher is the best place when there is space, or you can just keep going and park on the roadside. Population 2,280. La Gacilly photo album. La Roche Bernard has been popular since Bernhardt, a Viking chief, realised its strategic potential as a port, and the sheltered anchorage is now a favourite with yachtsmen. 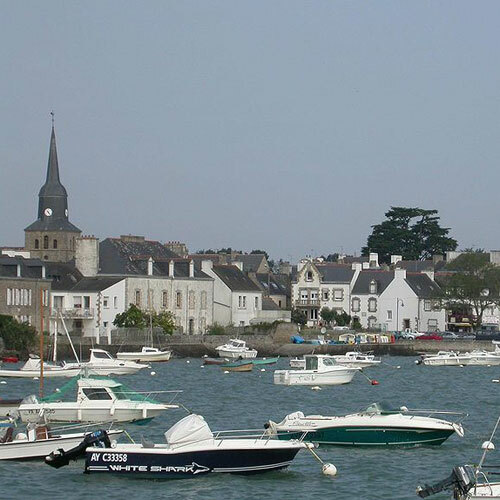 This quaint and pretty town clings to the rocky cliff face overlooking the Vilaine estuary. As well as the little streets around Place du Bouffay, there is a museum of maritime history. La Maison de l’Abeille is an interesting and educational trip through the world of the bee, with a shop supplying honey. For the nautical, there are trips on a traditional sailing ship on the River Vilaine. La Roche-Bernard has been designated a Petite Cité de Caractère (small town of character) in recognition of its historic nature, and is well worth a visit. There is a boat restaurant, where you can conveniently combine a good meal with boat tour of the Gulf. There is an excellent range of restaurants and the old quarter is packed with charming flower-decked houses, and has become an artists quarter attracting crafts people displaying pottery, paintings, leatherware etc. There are regular craft markets where the resident artisans combine with visiting artists who set up street stalls to bring together some of the best quality craft items in Brittany. Population 815. La Roche Bernard photo album. 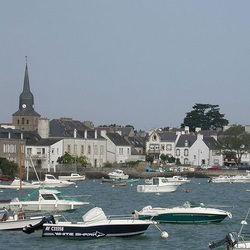 La Trinite, the former port of Carnac, has become world famous as the champions’ yachting port. This is where Eric Tabarly and his successors experienced their moments of glory before they collected prizes around the world. The marina has berths for 1,000 yachts and is always full. Races, regattas and parades of tall ships are held throughout the year. There is a good selection of places to eat. We had a nice lunch at a cafe Au Palais Gourmand, situated opposite the marina with a great sea view. It's a short drive to the Pointe de Kerbihan with six lovely beaches and a nice coastal footpath around the peninsula. The Plage de Kerbihan is usually quiet as it is a little more difficult to find, but only a short walk from the car park at the point. Population 1,600. La Trinite-sur-Mer photo album. Pointe de Kerbihan photo album. This pretty oyster port guarding the neck of the Golfe du Morbihan rivals Carnac in archaeological importance. Its main sites lie in a fenced compound north of the village. They include a huge menhir on its side, broken in four sections. If it ever stood upright it would have measured over 65 feet high. Locmariaquer is a peaceful place with attractive south facing beaches and a pleasant old harbour from where you can get a variety of boat trips. A great place to visit on a Sunday - it has a lovely market and a very good beach at L'amour Plage.A wide variety of different types of restaurants/bars. The revitalised dock land and state of the art fish market at Lorient makes for an interesting spectacle on its vast harbour. Boat trips to Ile de Groix and Belle Ile are a popular excursion from Lorient. The fishing port is immense (second largest in France) and worth a visit for the auction of the morning catch. The old submarine base, originally built by the Germans, is now deserted - the last sub left in 1997. The tourist office arranges daily visits. Alternatively, there are visits to the Victor Pleven, a trawler once used for cod fishing off Newfoundland. Also known as the 'pearl of the west', which indicates something of its attractiveness. Its old quarters are exceptionally well preserved with gabled merchant houses of stone and timber. The church of St-Gilles is also worth a look. It was originally built in the 12th century, and modified in the 16th century. 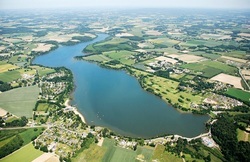 The village is on the Nantes-Brest Canal and makes an ideal starting point for strolls/cycles along the canal towpath. In summer you can hire a motor boat from Canal Loc56 - boats take up to five persons. Not far west is the Musee de la Resistance Bretonne, an open air museum that tells the story of Brittany's part in WW2. On Thursday mornings a large market fills the church square offering huge quantities of local seafood and regional produce. Population 2,500. Malestroit photo album. Mont Saint Michel is an 11th century Gothic masterpiece that rises majestically from its own little rocky island in the Bay of St Malo. 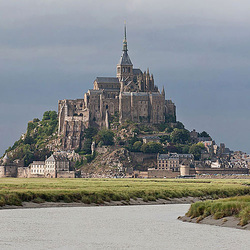 It has been a place of pilgrimage for well over a thousand years, and is one of France's major tourist attractions listed as an UNESCO World heritage Site attracting more than 3 million visitors a year. Ploermel is the nearest larger town to the cottage. Ploërmel takes its name from Armel, a 6th century English monk but little remains of its illustrious past. The St Armel church has some fine stained glass and granite tombstones in the transept. The astronomical clock, classed as a national monument, was built in the 19th century and has 10 panels depicting the solar system. The Maison de Marmousets in Rue Beaumanoir is the most famous landmark in the town and has some marvellous wood sculptures on its facade. The old town has a variety of cafés and restaurants as well as a market on Friday mornings. 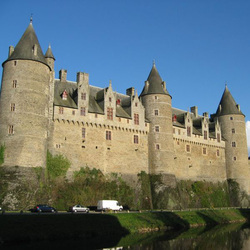 Ploërmel is a larger town than Josselin, with more shops and a commercial centre, but in our opinion, does lack the charm of its smaller neighbour. 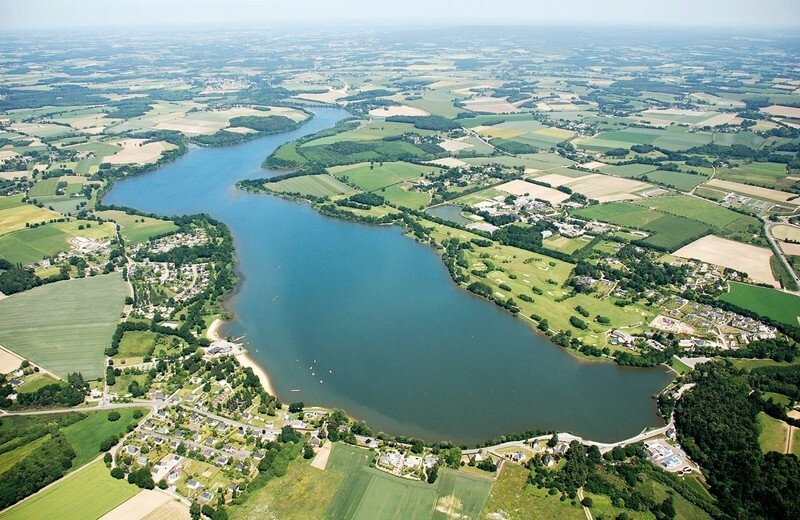 The Lac au Duc lies just outside the town and is one of the largest natural lakes in Brittany. It has a man-made sandy beach with free parking and supervised lake swimming (summer). Water sports including sailing, water-skiing, kayaking and pedalos are available at the Yacht club. There is also a small restaurant/café and takeaway open during the summer. Golf Club (9 holes), tennis and fishing are also available. Alongside the lake runs the ‘Voie verte’ a 53km cycle track open to everyone to enjoy cycling, hiking, roller blading or just strolling. You can also enjoy a walk around the waymarked Hortensia (Hydrangeas) Trail, or walk around the lake or cycle (14km). Population 5,000. Lac au Duc photo album. Lac au Duc cycle photo album. Amazing buildings, great shops - especially the odd little ones up side streets. An evening walk along the canal really makes you forget the rest of the world. Monday is market day in Pontivy. 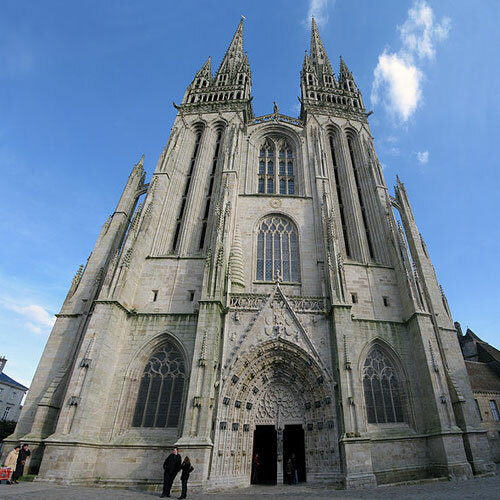 The church of Basilique Notre Dame De Joie, in the centre of the town is well worth a look around. 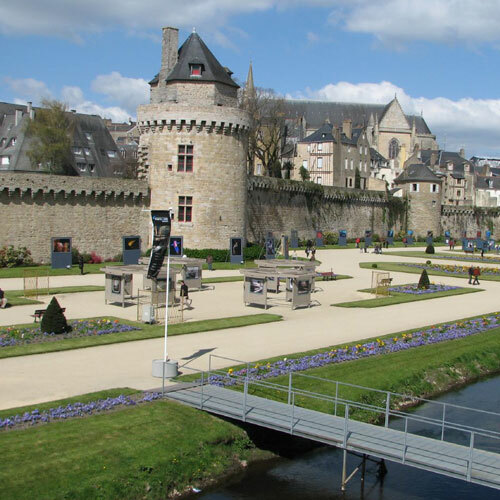 Pontivy is in two halves - the medieval town with its fortified 15th century château overlooking the river and the regimented streets laid out to Napoléon's plan. It was a military base and he renamed it Napoléonville. 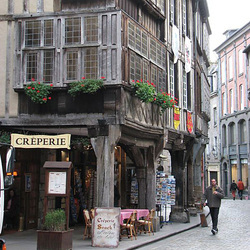 The old town, around Place du Martray, has narrow streets and overhanging wooden houses and a good Monday market. Population 15,000. Pontivy photo album. 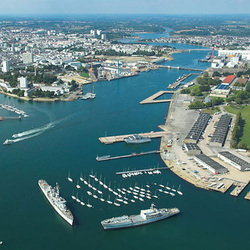 A small port on the coast, near Lorient, Port-Louis is known for its heavily fortified Citadel which is a flagship example of military architecture, and has an extraordinary view of the harbour. The Citadel was originally built by the Spanish. 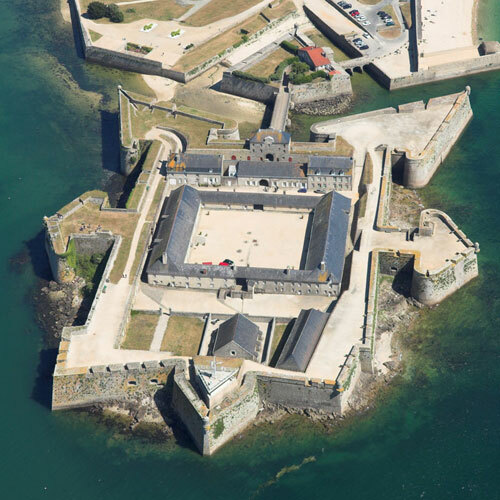 The Port-Louis Citadel is now home to the National Maritime Museum, where you will find an excellent collection of model ships, weapons and other historic models. You can also visit the museum dedicated to the history of the Indies Company. In the Arsenal Room, there are displays of superb vintage models, as well as paintings and sculptures depicting French naval history from the seventeenth to the early twentieth centuries. The Powder Keg Room houses a large collection of weapons. There are several beaches in little coves both sides of the Citadel, but the largest beach is reached through a arch in the defensive wall, which also provides a good wind break and sheltered backdrop. The children will enjoy combing the beach for a wide variety of shells, and there is a beach front cafe serving snacks, crepes, drinks and ice cream - a touch expensive but with unparalleled and uninterrupted views of the sea and the Ile ou Groix laying just off shore. La Dame Blanche is a delightful cafe for refreshments. Population 2,800. Port Louis photo album. 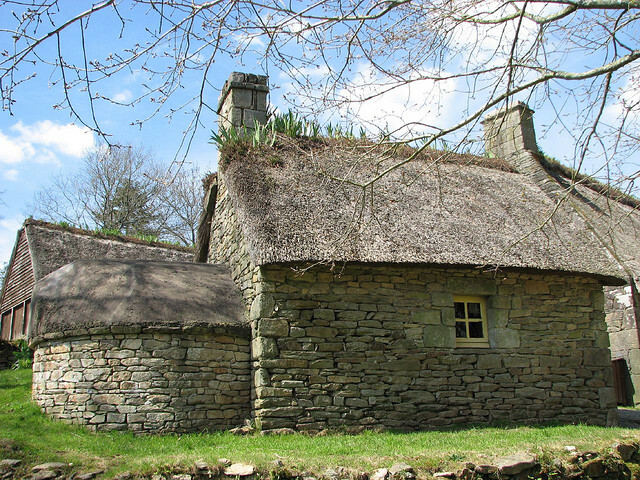 Two km south of Quistinic is the 'living museum' of Poul Fetan - a pretty village of thatched cottages complete with a working pottery and bake house, that preserves the traditional crafts and farming practices of 19th century rural Brittany. For centuries the village of Poul-Fetan was home to 4 or 5 families, and was inhabited until 1970. It was acquired by the Quistinic Community in 1977 and restored. 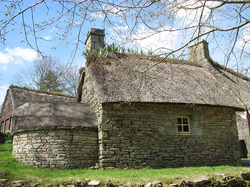 There are a variety of daily demonstrations which include wool spinning, crepe making, Breton games, washerwomen, head-dress starching and hand milking the cows. We thoroughly enjoyed our visit and would suggest allowing about 4 hours for a leisurely tour of the village and watching most of the demonstrations. There is even an Inn where you will be able to sample traditional food and drink of the era. You can combine visits to St Nicolas in the Blavet Valley, with perhaps a picnic lunch and walk, and Poul Fetan in the afternoon to make for a good day out. 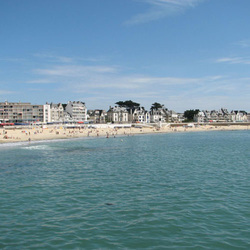 The resort of Quiberon at the far end of the peninsula is one of the Morbihan's liveliest and most popular. Besides the good sandy beaches it is also the ferry terminal for Belle-Ile and is always crowded in the summer. There is every type of water sport to satisfy the most ardent enthusiast. The Quiberon peninsular was once an island linked to the mainland by a string of dunes. Lovers of solitude can lose themselves walking along the Cote Sauvage (wild coast). The peninsular has a string of lovely beaches, just drive along and you are sure to find a spot you like. You can park at the end of the peninsular to walk around the headland. Saint-Pierre-Quiberon is 3 miles north of Quiberon. This small resort has lovely sandy beaches. 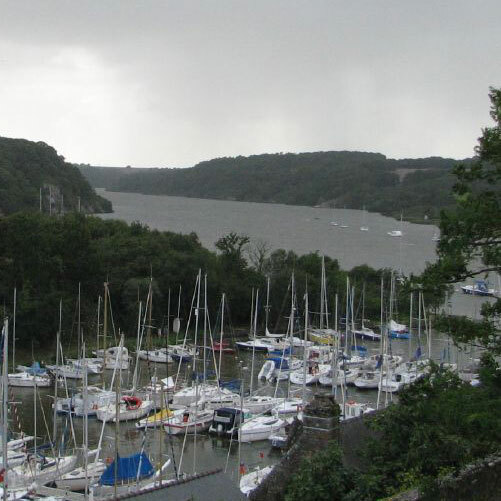 Since 1966 the National Sailing School has been based here, and it is one of the leading training centres in Europe. There is also a sand yachting club. Population 5,049. Quiberon photo album. The town is famous for its brightly painted pottery, which is sold at many of the gift shops. If you are looking for somewhere to eat, we can recommend La Krampouzerie at 9 rue du Salle. This is a great small creperie using bio flour. This restaurant shares a third of the pedestrianised square with other creperies, creating a lovely intimate atmosphere and just round the corner from the cathedral. We had the cheese and seaweed galettes washed down with a boule of cider (served with traditional pottery mugs). Galettes on their own or not so filling so we would advise a side salad. For desert we had a crepe with banana, caramel sauce and almonds, which were delicious. 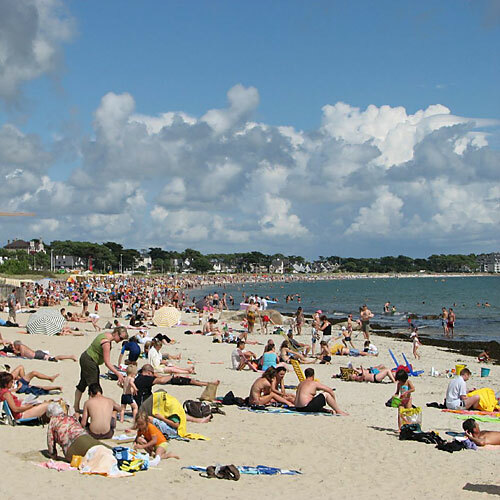 The capital of Brittany is not a particularly large city, with 200,000 population, but 60,000 of those are students, which lends a lively feel to the place - and a high proportion of bars! The two universities in the city mean that Rennes is just as busy at night as it is by day. 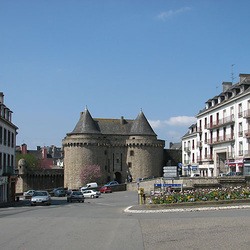 This is the cultural centre for the region, with the Breton Museum, The Musee des Beaux-Arts (fine art)and the National Theatre of Brittany. Entertainment is not confined to formal buildings, with street festivals and fairs held throughout the year. Highlights for the day visitor include the wonderful architecture such as Brittany's parliament building built in the 17th century and the timbered buildings, the oldest of which is the Auberge des Barrilieres built in 1580.The Garden of Thabor is a 24 acre garden right in the town centre, and once belonged to an abbey. Every Saturday morning there is a market in the Place des Lices, and it is one of the largest markets in France with an impressive flower market. There is no shortage of places to eat and drink. The Rue Saint Michel has been nicknamed the 'Street of Thirst' by locals due to the fact that nearly every building is a bar. The locals eat lunch at the pavement tables of the little restaurants centred on the old Town. ​In terms of practicalities, we recommend you park in the free underground car park for the JF Kennedy Metro Station, then catch the underground train to the Sainte-Anne stop in the city centre retain your underground ticket, you will need it to get out of the car park). Population 206,000. Rennes photo album. The little village of Rochefort-en-Terre is utterly enchanting. Be sure to take your camera because this place is so photogenic. 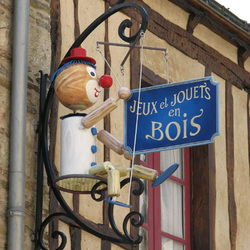 In 2006 it was voted by the French as their favourite village in France. The sight of the houses huddled on top of a spur of shale overlooking a luxuriant green landscape seems to have come straight out of a fairy story. When you visit the village you may notice that there is not a television aerial or electricity pole in sight. The village is remarkably similar architecturally and seems to come from another age. Furthermore, its granite walls are brightened with huge banks of multicoloured flowers in boxes and baskets. Most of the original chateau has now disappeared. The present house consists of 18thC buildings turned into a manor house. Four rooms are open to the public and a small regional museum displays items from local village life. There is an interesting antiques shop selling a huge range of local artefacts. Take a look at some of the remarkable buildings in the upper town, consisting of 15th, 16th, 17th and 18thC houses with carved granite window frames and corner turrets. A good hour or two can be spent exploring the dozens of small boutique artist shops selling a wide range of hand made goods that include clothing, jewellery, paintings, handicrafts, pottery, baskets, pastries, chocolates, fudge, and much more! Each shop has its own painted or crafted sign that is a work of art in itself. A 6 mile way marked trail takes you from the village to the slate quarries of Malansac, besides a stream, through an oak wood and across moors – you will be rewarded with magnificent views of the Grees, the rocky hills around Rochefort. There are plenty of places to eat, Michelin recommend Le Pelican which is full of character in a 16th and 18th century house on the main street (meals 18-38€). We can recommend Cafe du Puits in the centre of the village. Population 693. Rochefort-en-Terre photo album. Doors & Signs of Rochefort photo album. Founded in the 6th century by the Welsh monk Maclow. It is now amongst one of the most visited cities in the world. Concealed behind the walls is an outstanding town, filled with places to visit. The coastline bristles with forts; it is also dotted with beautiful sandy beaches. If you arrive by ferry, then St Malo is the nearest port for the Morbihan area. 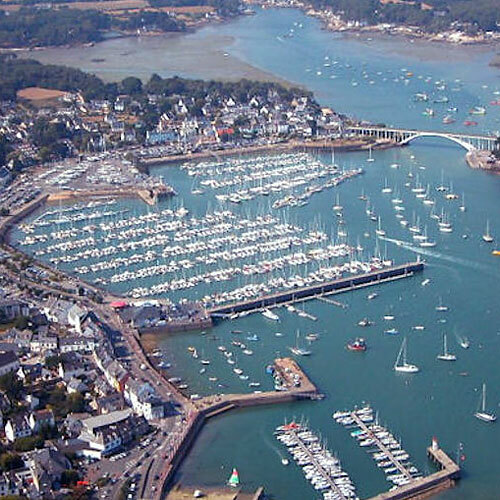 If you have some time on your hands, instead of rushing off with the rest of the ferry traffic, why not stop and have a look around the most popular tourist town in Brittany? A truly attractive town, and highly recommended for a day trip from the cottage - Wednesday or Saturday are best as you will experience the busy street market and the centre of town is closed to traffic making strolling the streets an added pleasure. As with many medieval towns, it is much better to park the car and walk around, there is free parking along the quay-side. The busier it is the further you have to go from the centre of town. We usually park on the left side of the quay and enjoy the 10 min. walk into town along the quay side. When you arrive at the Place Gambetta at the waters end you have a lovely paved area occupied by restaurants more reminiscent of a mediterranean quay side. The fortified gate entrance into the town of Vannes lies in front of you. 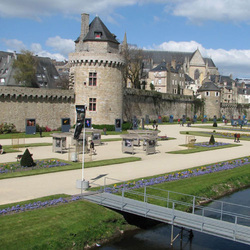 Vannes hosted the 16th century summit when the Duchy of Brittany became united with France. Since then the old town, behind its ramparts, has remained more or less untouched. One guide book describes the old town as looking like an open-air museum. There is one point near the Cathedral where the overhanging houses on the two sides of the street almost touch at the Place Henri IV. A guided tour from the tourist office is a good idea as there is so much to see. You can catch a small tourist train which takes you on a tour of Vannes in about 30 mins between Easter and October 15th (except Wednesdays and Saturdays as the market blocks the streets), but you're really best exploring on foot. All around the cathedral is worth exploring with the ancient houses, Musée des Beaux Arts and the old streets with some very chic shops. There are hundreds of small specialist shops, so if shopping is your thing you can spend many hours just exploring them. The old washing area, or Vieux Lavoirs, is to be found in the beautifully laid out formal gardens and lawns in front of the old ramparts. These old city walls are among the best preserved in France. On a hot day young children will enjoy taking off shoes & socks and spending far too long paddling barefoot in the shallow river, especially when they discover visitors are in the habit of throwing coins into the water! Our recommended restaurant is the Pizzeria Villa Romana (16, rue des Vierges), which has the best outdoor terrace in Vannes, overlooking the ramparts and Castle gardens. Arrive soon after 12 if you want a terrace table in summer. If you are looking for a good creperie, we can also recommend the Creperie Grill Saint Vincent at 16 rue Saint Vincent. There are numerous excellent bakeries and a branch of our favorite Belgian chocolate shop Leonidas. The quay side area has undergone considerable redevelopment and improvement in recent years. There is now a new cafe with first floor open air terrace. Nearby, a bank of self-hire city cycles has popped up. It is one of many other cycle stations around the city, housing 180 bikes in all, supplied by a UK company. I think you need a credit card to swipe to obtain one, and you can drop off the cycles at other cycle banks dotted around the city. 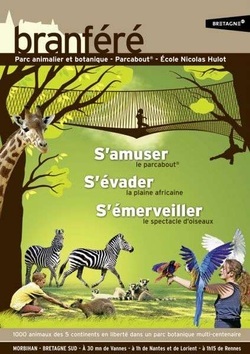 Along with the archaeology museum and old houses there is a leisure park Parc du gulf near the gare maritime. This has a butterfly farm and an aquarium and provides a departure point for boat trips to the gulf islands, in particular the Ile d'Arz. There is a free park and ride shuttle bus provided that links to the Port and Conleau, the nearest sandy beach. You can either park here and then catch the bus to Vannes Town or the beach, or do it the other way around and catch the bus at the west quay side in Vannes. We would not recommend trying to drive to Conleau unless it is off season or you are very early - there is not much parking and it quickly becomes congested with those hoping to find a parking space. Conleau has a small sandy beach and huge salt water swimming pool; each time the tide comes the water is retained behind a wall. Population 55,000. Vannes photo album.